2019 Race Registration is Live! Does a bear cramp in the woods? 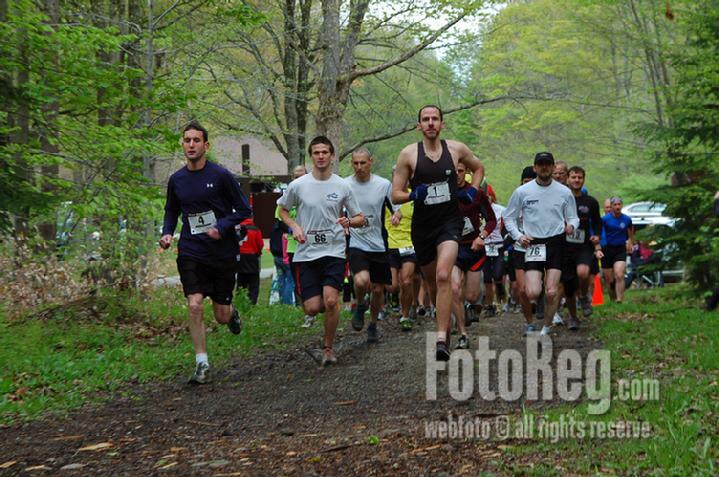 The 2019 Allegany Adventure Run kicks off the trail running season in beautiful and challenging Allegany State Park in Salamanca, New York. The Summit Ski Area in Red House is home base for this annual wild and challenging experience covering one of three course distances that suit your fitness level. 5K, 13K & 27K courses held on 100% forest trails provide a demanding backdrop for this annual challenge on wide, rolling mainly non-technical trail sections near starting and finishing at the brown gage across from the Summit Ski Area. Plenty of parking and camping facilities throughout the park. Tent camping is not permitted at the Summit Area (race site) however other sections of the Park offer many tent and cabin rentals within a few miles of the starting line. Book early! 15 Cabins are available up at the race site. Do it. Packet pickup and race-day registration opens at 8am at the Summit Ski Cabin. Field limits: 150 for each distance. Pre-register by April 27th to guarantee your t-shirt. We cannot guarantee race-day shirts to those who register after this date. 5K is the perfect option for experiencing a walking or running course close to the starting area on Sweetwater trail. A few climbs keep the lungs and legs working and will surely give any entrant a good nights sleep after the race. The 13K course includes Sweetwater, Christian Hollow and Leonard Run and is no walk in the Park! Rarely flat this course is very popular and features many rolling climbs and descents non-technical in nature for experienced trail runners or those with a decent early season base. 27K-what can we say! The grandaddy of the AAR weekend uses the same trails as the 13K for the first half but turns down Ridge Run and includes Thunder Run: a 3-mile section of technical single-track that will be sure to keep your attention. After exiting Thunder Run the trek back to the summit via Ridge Run and eventually Patterson Trail features the infamous 2-mile climbing finish. We request at all entrants be properly trained for this distance. Time limits will be imposed at the main split near mile-8 of the long course in order to accommodate all entrants for their safety and timely return as Park staff, marshals and guides accommodate this event and verify all return timely and safely. Walkers are welcome on the 5K course. Cutoff-times will be enforced on the 27K course. Runners must make the turn down Ridge Run after Leonard Run (Mi. 7.5) by 10:45am. Our volunteers and staff spend many hours in remote sections and safety is priority #1 in prep for the last half of this bear of a course. Water stations: 5K none. 13K two water stops. 27K Four water stops. Please pack your own water/fuel and help keep our trails clean by never littering on the couse. Accommodations: Allegany State Park offers hundreds of cabins and tent sites throughout the Park. A handful of cabins surround the AAR basecamp up at the Summit in the Red House section. Book swiftly for they always sell out. Other cabin sites at the base of the mountain are within a few miles of the start/finish. Camping over has become a tradition for families, teams and fiends. Experience the thrill of beautiful Allegany State Park with sore legs. Directions to the Summi Ski Area: From Rt. 219 enter Park as you go under Viaduct for Rt. 86, through Park toll and up, up, up to the Summit Ski Area featuring cabins and main lodge. This park road is knows as ASP1. From Rt. 86 exit 20 takes you the same way up to the summit on ASP1. From the Jamestown direction on Rt. 86 exit 19 takes you in to the lower section of the Park near Red House Lake via ASP2. Make a left at the stop sign on ASP1 (the lake will be on your right as well as the registration building for all cabin/tent reservations/check in's) and you will proceed up to the summit where the Ski Cabin is on your left. Races start and finish at the brown gate across the street from the Ski Area parking lots.